Town boss Neil Aspin hailed his team’s against-the-odds win at Dartford as the Shaymen finished with nine men after Lois Maynard and James Bolton were both sent-off. Town finished the first-half a man light after Maynard’s dismissal with the game at 1-1 before Scott Boden’s penalty put the visitors ahead. Bolton was then ordered off but the nine men survived to claim all three points. Aspin said: “When you play the last 26 minutes or so with nine men and you come away with the three points I’m obviously really pleased with the players’ efforts. “They’ve done me proud and they’ve done the supporters who’ve made the long journey here proud. “It was a fantastic three points, probably the most hard-earned three points we’ve had all season. “Even with 11 men, you know that coming away when it’s a long journey and the players have travelled down on the day of the game, it’s going to be tough. “Then going a goal behind and then with the sendings-off it makes it really difficult. “But it’s obvious they had a big bearing on the game. “There’s two sendings-off, one was because it was a reckless challenge but the first one was never a sending-off in a million years. 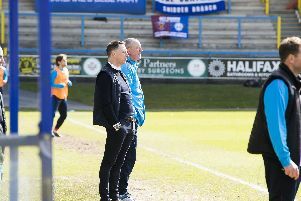 Aspin was left exasperated at Maynard’s dismissal, and said the club would look at the footage before considering whether to appeal the decision. “It was just one of those where the player was tight on him and he was just trying to get away from him,” Aspin said. “He didn’t elbow him in the face or anything like that. “I think everybody was amazed. You can tell by the look on Lois’ face he just couldn’t believe it. As for Bolton’s red card, Aspin admitted the defender’s tackle warranted the dismissal. He said: “When you’re playing a game with nine men you wouldn’t be surprised if the opposition scored. “With 10 it’s not too bad but when you go down to nine it’s asking a hell of a lot to hold onto the lead. “James isn’t a dirty player but although he got his foot on the ball it was reckless when his foot left the ground so he’ll have to learn by that. The Town boss had praise for Boden after the striker came off the bench to notch his 12th goal of the season. Aspin said he didn’t see the alleged handball clearly: “I didn’t get a great view of it but I think I shouted for a penalty. “You’re always biased but I think it was and credit to Scott Boden, he’s just come on the pitch. “He’d be disappointed he wasn’t starting the game but we had a formation we wanted to play and he was on the bench. Matt Pearson drew Town level with his second goal of the campaign and Aspin was pleased with the midfielder’s contribution. He added: “Matty was fantastic for us last year. By his own admission he hasn’t played as well this season. “But that’s natural sometimes with players, you can have dips in form. “As a lad, his character and his attitude, he’s got everything that I like in a player. “Like I said to Matty, I hadn’t fallen out with him, I just felt he had to get back to doing what he’s good at. “i think he got a little bit carried away with trying to get forward all the time and taking up some bad positions. “But he came on on Saturday and I thought he did well. He was disciplined and he gave a really good performance tonight so I’m really pleased.